Every once in a while I pick up a romance novel and try again, but I think I have to finally admit defeat. I just don't care for novels where the romance is the central conflict and/or motivation. It has nothing to do with the quality of the writing, the rounded-ness of the characters and relationships, or the historical setting or lack thereof. Stories about romance don't capture me. Now, if there's a bit of romance on the side, that's just fine, but when romance takes center stage, I lose interest. After reading a book which several of my friends have loved and sung the praises of, a finalist for a Whitney Award, obviously highly regarded by many, and still reacting with a "meh," I think it's time to accept that romance novels are just not my thing. Kate, who is not an orphan - though she perhaps wishes she were - is finally invited by Henry and Sylvia, her friends since childhood, to visit them on their summer estate, Blackmoore. Her mother pushes her to accept the marriage proposal of a much older man, which Kate refuses, and then Mother lays down this ultimatum: if Kate can receive and reject three marriage proposals while at Blackmoore, she can go live with her aunt in India. Otherwise, she must agree to accede to her mother's demands and marry this older suitor. Kate rashly accepts the bargain only to discover that the indiscretions of her mother and older sister have tainted her in the eyes of the other guests at Blackmoore, dooming her to fail. Of course, friendship and fate intervene. Don't want to spoil it for you, but it shouldn't be much of a surprise in this genre when all turns out right in the end. 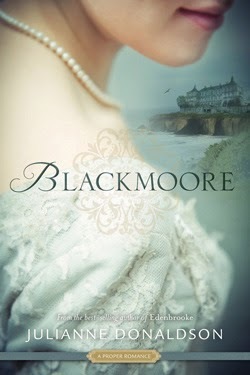 I appreciate that Blackmoore is "A Proper Romance". There's no bodice ripping or heaving bosoms or what-have-you. Kate is a sympathetic character: fiesty, independent, proud, but also compassionate, curious, and unfairly limited and burdened by the actions of others. Her greatest fear is "that all of my dreaming will end in disappointment...as if I am incapable of truly being happy. As if my ambition will be my curse. My dreams will turn into my condemnation." Kate obviously feels very trapped by her circumstances, her family, her financial and societal limitation, and we, the readers, want her to succeed and be happy.